When you hook these up, dont forget which pin you wired to the +5V and which you wired to ground. When you switch them, the chip makes a neat crackling noise then heats up enough to blister your finger when you touch it. This is a really good price for the7219! this IC is also used to drive a 8x8 led matrix display (most people already guessed that tough) and there is a Arduino library available. very good IC if your planning to work with 7 segment displays or Matrix displays. 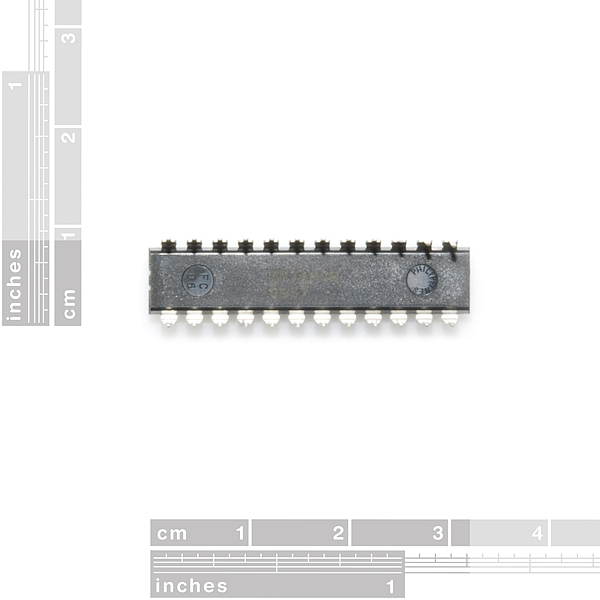 There is an article in Nuts & Volts Feb 2010 page 56 describing this chip and interfacing it to a PICAXE-08M. Will we be seeing a right to left breakout board for this chip using your 4 digit 7 segment displays? 8 digit board with connector on ends to link them together. Pity that this device is for common cathode and the 7 segment displays (here, anyway) are common anode. I'd love to hook something like this up to the 4 digit 7 seg I bought a couple weeks ago. But seems like all the drivers are for common cathode. You can drive common anode displays with this chip just fine. It has 8 cathode outputs and 8 anode outputs. The only thing you lose is the BCD-7 segment decoder, which would work strangely hooked up to a common anode 7 segment display. But if you're just telling the chip which segments to light directly, it'll work just fine either way. Can you give some details on how to wire the chip. Would DIG-0 on the chip goto SEG-A on the display. And SEG-A on the chip to DIG-0 on the display? Since the chip is common cathode and the LED is common anode. Update: I did get it to work with a common anode LED display. Here's are the connections. I didn't notice these were common-cathode at first. 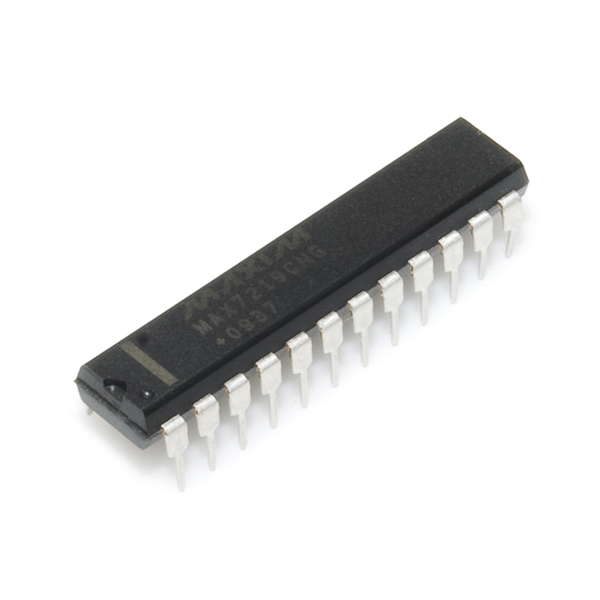 There is a common-anode chip, the ICM7228. I just ordered some from Jameco to drive displays I got here. 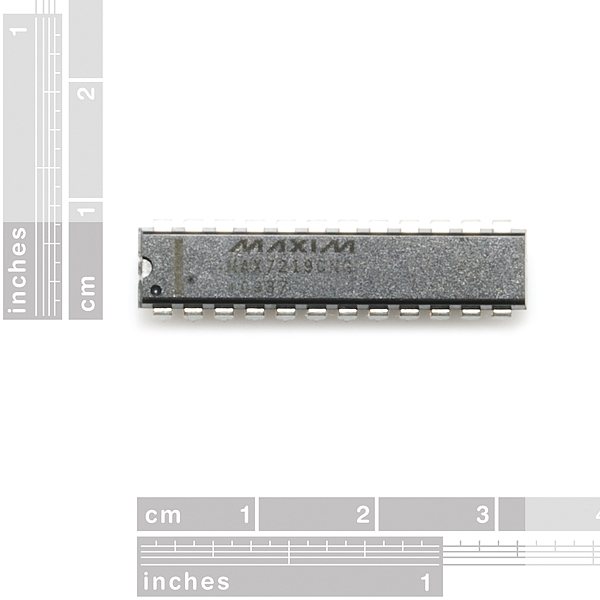 The ICM7228 and MAX7219 have a huge difference: ICM7228 is parallel input, while MAX7219 is SERIAL input. That makes the ICM7228 impractical for the PICAXE-08M. This is an asinine comment. Please ignore. The inverter (logical inverter or NOT gate as opposed to a power inverter), that is required depends on how many outputs you are going to use and the logic level. For example, to drive a few 7-segs with this 5V IC, a 7404 Hex inverter will do the job (6 inverters in one 14pin DIP or whatever package ya like). If you plan to use all 64 outputs, that would be 11 7404 ICs with a few gates to spare. There may be a better driver out there, but the suggestion of using an Inverter to change a common cathode output to a common anode output, or vice-verse can be an efficient option in digital. Except the 7219's outputs are current sources. Inverters won't work here. how would you go about wiring this? Does anyone know how to set this up for non-8x8 matrix, maybe 4x16? Maybe you should remove the 7221-specific features from the description, because they don't apply to the one you're selling. Great! If you need some quality led products(displays, walls, etc.) I'd like to recommend you http://www.dynamo-led-displays.co.uk/ where you can find absolutely everything you need. Maxim chips sure are expensive in small quantities! But you're cheaper than Digikey - they want $11 per chip (unless you order 100 or so of them). Hi can anyone help with info on how I can assemble a home lift call, 12 volt dc all calls are in parallel with each other and the car plate. Need to display on all calls - car location - direction of travel - a list of programed fault codes. So this chip just stopped working and I'm having a hard time figuring out why. I changed my code to increase the intensity to 100%, but the LEDs are not the problem. It worked at 100% for a while (like 10 min) then froze. I've looked over the data sheet, I must be missing something. So... How do I connect this to the 7-segment LED's on SFE? This is a common cathode driver. The 7-segment displays SFE has on offer at the time of this post (2012/Oct/11) are common anode. Which I would guess is why they don't show up in the related products list. If the high state is close enough to the voltage you put on the anode, AND the pins can sink enough current (and you stay under the package's total current sink limit), yes. From the datasheet, though, it seems that the maximum sink current per segment is a measly 5mA and the digit drive source current is almost entirely useless. Here's my dumb question - if I want to use this to drive a COM-00682 dual color 8x8 matrix, do I need 2 (one for each color), or just one? IIRC, there's 24 pins on the matrix. I'm talking individual LED control, not text. Ultimately, I need to figure out how to use 4 of those COM-00682s for 256 dual color LEDs, but fine getting started w/ one. Using an Arduino. Thanks. Would it be possible to (also) sell these?? An amazing chip, and hard to find any cheaper then here. Mouser stocks it at $11.18 for one, with straight from Maxim price at $12.61. They do have free samples of both the DIP and SOIC style chips. Just takes about 2 weeks to get them. Jameco.com sell them at a cheaper price. I just picked up two for a total of 14$. I still love Sparkfun. Great LED displays driver you introduced. I normally buy 6 digits driver for my LED signs. Now I will try this as its features are awesome and probably it is also most advance than others. Would this be a good choice for the development of a 4X4X4 LED cube? It will work, the LEDs will be split into groups of 8. You may go crazy visualizing which individual LED in each group of eight is turns on by which SEG pin, I know I would. It might be easier for you to simply use a MUX. Unless you want the LEDs split into groups of eight. Make sure you use current limiting resistors so you don't burn out the LEDs. Nice... I've been working on a project with the Philips SAA1064, but this one will drive double the segments (albeit likely at a lower maximum current). This is exactly what I need, but I need something with a max V+ of 12V. I checked Maxim and I don't think they have such a thing. Any ideas on an alternate supplier of a similar chip? Use the old ULN2003 or ULN2803 to use those voltages. ULNs are hi-output current, open collector darlington drivers. They might work. use the chip to control n and p channel mosfets, that might (stressed) might work. I've breadboarded this with some LEDs and used it with the Arduino library, and it worked fine the first time. It'll drive discrete LEDs or 7-segment displays and do the 7-segment decoding for you. No visible flicker when multiplexing. I'm currently building one into a proton pack! Wanting to build and control an 8x8 matrix of LEDs, I set about learning how to use an Arduino. I'd already been a little proficient with programming, but had hardly any experience with circuitry. This was the chip which let me get the grid working! It was my introduction to circuit schematics/diagrams and dealing with calculating V=IR. Wasn't nearly as bad as I had worried it would be, and now I have a nice little matrix as a toy I built (planning on putting 4 of these together for an eventual 16x16). This chip works beautifully. Nice libraries for support with the Arduino, and many tutorials for guiding the lost (of which I was one). This driver works great for multiplexing led projects. Currently working with it on a project with 8x8 led matrices, so I'm looking to daisy-chain 2 of the 7219s to drive 2 matrices. My last couple of these (from a different vendor) died after a very short while. The ones I've purchased from here are doing great (so far)!